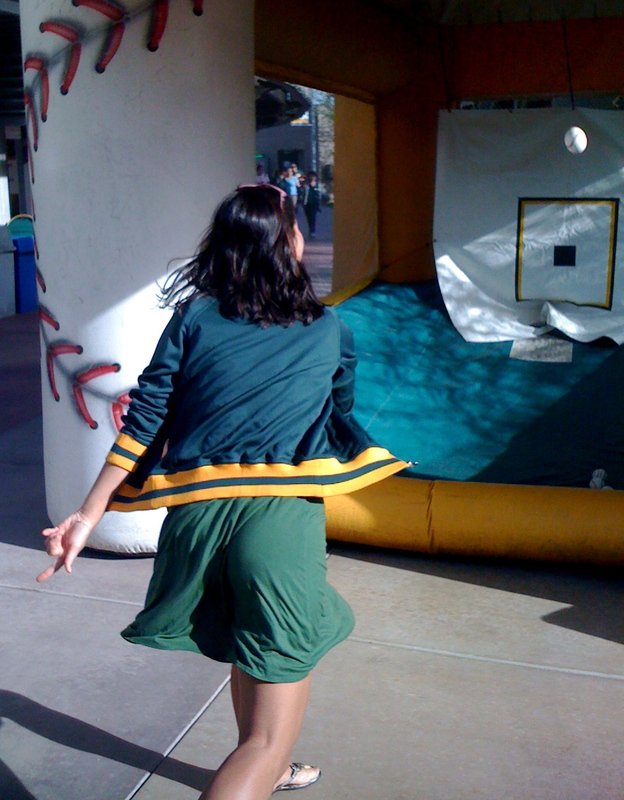 Hi fans, Kara here with some more fun tidbits from Spring Training. Before we get to the photos, I’m proud to introduce my very first video post to this blog. Check it out by clicking right here. The fantastic Diamond Vision team, Troy, David, Jon and Jeff work so hard to create awesome multimedia content, so thanks to them for posting this link so quickly. More to come in future blog posts! Fans visiting the Muni during the second week of Spring Training were lucky enough to have the opportunity to meet some of Oakland’s greats: Vida Blue and Bert Campaneris (Rollie Fingers was also there, but I didn’t see him when I took this photo). In typical ST fashion, these guys were so casual, signing autographs and joking and chatting it up with fans. You can really tell that both of these two guys still love to be around the game of baseball and are committed to giving back through the sport where they made their names and established their legacies. 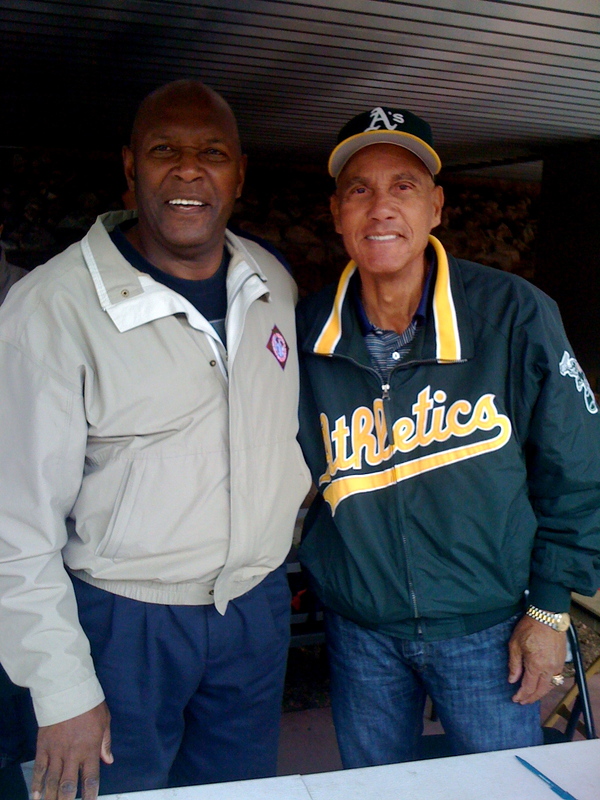 Both Vida and Bert are also avid golfers, so I very much look forward to seeing them at the next A’s Community Fund Golf Tournament later on this Spring. For all you gamers out there, I know the fun of playing MLB games is the startling accuracy of the way the video game players look compared to the real ones. In this photo to the left, you can see some of the technology at work. During the early days of Spring Training, players (in this case, Kevin Kouzmanoff) would visit a corner of Phoenix Muni and sit in a special chair that can lift and lower and rotate. While they were moving around, tilting in different angles, a dozen or more cameras would capture their every facial detail. The whole process would take fifteen minutes or less — can’t wait to start playing with my 2010 Oakland team! 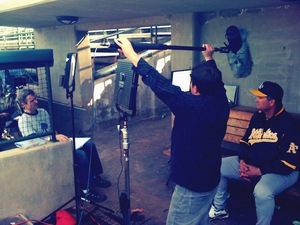 Be sure to keep an eye out for the new series of Oakland A’s television commercials running this season. In typical A’s fashion, they’re hilarious, some with more subtle, dry humor and some that hit you over the head with silliness. 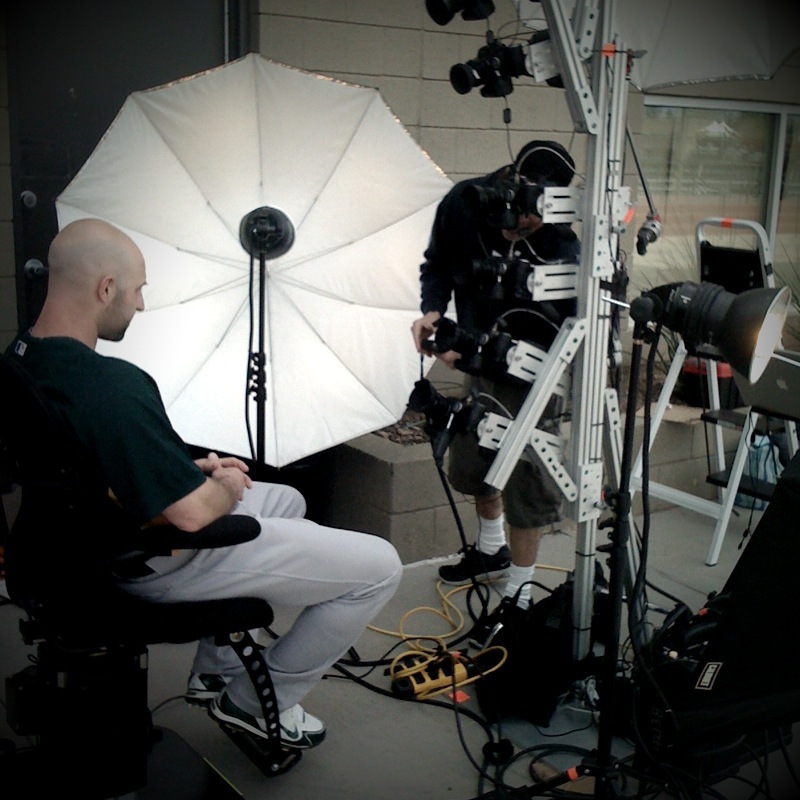 The photo to the right is from a shoot the Diamond Vision team did with Bob Geren. In this picture, Jeff is holding the boom mic while Troy feeds Bob lines to — you can see what a production just a short scene can be!